Features a water-resistant coating that is instant dry with dye or pigmented ink. It serves as an excellent choice for short term, temporary graphics. It also allows for heavy ink coverage up to 300%. 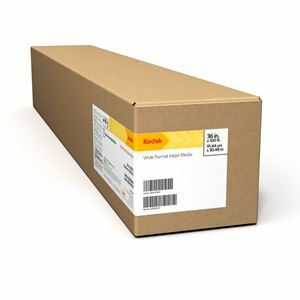 Kodak Production Matte Paper / 170g provides users the ability to print high-quality, low-cost photos on a smooth, bright white surface. Production Matte Paper covers the application spectrum, and is perfect for architectural drawings or full-color photos. It provides high ink-load retention needed for saturated colors, quality images, and brilliant colors. This paper can be thermally laminated, making it ideal for producing high-impact graphics. It is often used by shops who want a low-cost way to produce high volumes of POP displays, posters, or color accurate renderings. It is universally compatible with thermal and piezo pigmented and dye inks, and is instant-dry.